Mayor Ras J. Baraka and Public Safety Director Anthony F. Ambrose swore in Police Chief Darnell Henry at a ceremony today at Newark Tech Essex County Vocational School, located at 92 West Market Street. Chief Henry, who has been serving as Acting Chief since his appointment earlier this year, was permanently sworn into his duties. “We are undertaking massive changes in the Newark Police Division in our efforts to eradicate crime, improve our quality of life, and unite our residents with our law enforcement agencies. 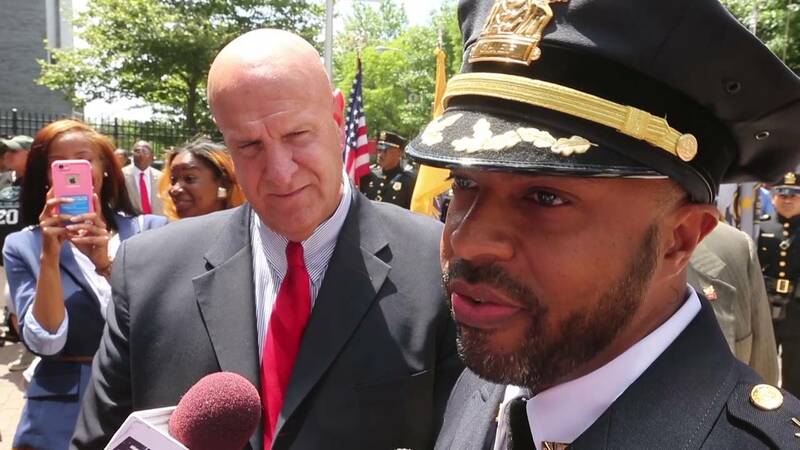 We have already put more officers on the streets, added accountability with the new Civilian Complaint Review Board, united residents with ‘Occupy the Block’ programs, and reorganized all our emergency response agencies under one roof,” Mayor Baraka said. “I am thankful to Mayor Baraka for appointing me to become a part of the leadership team of the Newark Police Division. I look forward to working with our many federal, state, and county law enforcement partners to work to improve the quality of life for all of those who live, work, and play in the City of Newark. As a Newark native who grew up in this City, I am committed to creating a safe environment for my neighbors and fellow citizens, in which to own businesses, raise families, and enjoy Newark,” said Chief Henry. Chief Henry was born in 1969 in Newark and raised in the City’s Central Ward. His childhood dream was to become a Newark Police Officer, and he began pursuing if after graduating from Newark Technical High School in 1987. Chief Henry has 22 years of service with the Newark Police Division, beginning with his graduation from the Newark Police Academy as part of its 101st Recruit Class, in 1994. He served in patrol work, as a detective, the Candidate Investigation Division of Internal Affairs, and both the Robbery and Homicide sections. He was commended for his attention to detail, unyielding follow-up, and impeccable work ethic. Detective Sergeant Henry and his squad received multiple accolades for the arrest of the suspects responsible for the “Mount Vernon School Yard Killings.” As a result, in 2007, Detective Sergeant Henry was chosen to supervise the newly re-established Essex County Cold Case Unit. He and his detectives successfully closed out numerous Cold Case Homicides and brought final closure to countless families. Detective Sergeant Henry’s reputation as an exemplary Law Enforcement Officer preceded him when he was tapped to head the Newark Police Executive Protection Unit in July 2014. There, he was responsible for coordinating and managing the safety and wellbeing of Newark’s Mayor, other elected officials and dignitaries. He was named Acting Chief earlier this year.